The spread of IPv6 in our networks is slow, but to refresh my IPv6 knowledge and use the LSPs configured in the previous post, I decided to configure an IPv6 mpls VPN between two sites. This solution is called 6VPE and introduced on IOS a new configuration syntax for VRF. The operations are very similar to a IPv4 MPLS VPN: vpn prefix and label are signaled by mBGP while, LDP and/or RSVP ensure the label signaling necessary to forward MPLS packet throught the backbone. The lab uses a virtual CE, realized exclusively with a loopback within each of the two PE involved. It thus avoids the entire PE-CE configuration as the purpose of the lab is to exercise on the MPLS component. 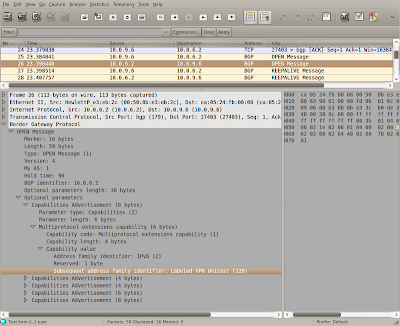 As vpnv6 signaling uses mBGP, we need to configure an iBGP peering between the two PE. The configuration proposed is minimal, and allows only the signaling of the vpnv6 AF (Address Family). The IOS PE requires a global enable for ipv6 ed ipv6 cef. In the BGP part is avoided the exchange of IPv4 prefixes while vpnv6 peering with a complete community exchange is enabled for J2. Until now we have used the logical system of Junos isolating in its own stanza all the configuration statements for the virtual router realized. The configuration of VRF rather intersects with the main routing instance ( or logical system ) which ensures the communication. The VRF is a particular routing-instance type in which the routing features are configured and the interfaced assigned, however the complete interface configuration remain global. On J2 the IPv6 address fec0:cc1e:1::1/128 is configured on the new lo0 unit 102.
then the "red" VRF routing instance is created, with route distinguisher assigned as the 2:2 route-target and 100:100. For those used to work with IOS there is no requirement to explicit configure the "redistribute connected" required to put the prefix in the mBGP table, all the prefix of the routing instance are automatically exported in mBGP. The "vrf-table-label" is not required in this case, but serves to ensure the operation of MPLS VPN in Olive, where the forwarding is not PFE assisted. In IOS there is a hidden IOS command “show ipv6 cef internal” used to show a set information very useful for troubleshooting and to understand the solution mechanisms. In the both cases there is a odd NEXT-HOP address indicated as ::FFFF:10.0.6.2 or ::FFFF:10.0.9.6. This is due to fact that the next-hop address required in the AFI/SAFI ipv6 is still an ipv6 address. In our case this is an IPv4 address ( the PE Loopback ) and this is replaced with IPv4 mapped IPv6 addess. MPLS and BGP are confirmed two key tools in providing simple and efficient solutions, allowing the transport of any type of traffic without changes to the backbone infrastructure.